The Cisco® Catalyst® 3750 v2 Series Switches are next-generation energy-efficient Layer 3 Fast Ethernet stackable switches. This new series of switches supports Cisco® EnergyWise technology, which enables companies to measure and manage power consumption of network infrastructure and network-attached devices, thereby reducing their energy costs and their carbon footprints. The Cisco Catalyst 3750 v2 Series consumes less power than its predecessors and is the ideal access layer for enterprise, retail, and branch-office environments, as it increases productivity and investment protection by enabling a unified network for data, voice, and video. -Lower power consumption than its predecessors. 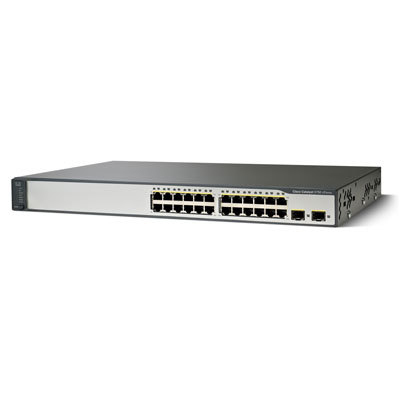 -Backward compatible with Cisco Catalyst 3750 and 3750-E Series Switches. -Full EnergyWise support to monitor energy consumption of network infrastructure and implement energy saving programs to reduce energy costs. -Compatible with Cisco Redundant Power System (RPS) 2300. -Uniform depth of 11.9 inches on all units for better cable management. -Preconfigurable with a Cisco IOS® Software release at the time of ordering. Cisco StackWise® technology is a stacking architecture optimized for Gigabit Ethernet. This technology is designed to respond to additions, deletions, and redeployment while maintaining constant performance. Cisco StackWise technology unites up to nine individual switches in a single logical unit, using special stack-interconnect cables and stacking software. The individual switches can be any combination of Cisco Catalyst 3750, 3750 v2, and 3750-E Series Switches. The stack behaves as a single switching unit that is managed by a master switch, chosen from one of the member switches. The master switch automatically creates and updates all the switching and optional routing tables. A working stack can accept new members or delete old ones without service interruption. Cisco StackWise stacking creates a 32-Gbps switch interconnection. Stacking does not require user ports. Up to 9 units can be stacked together for a maximum of 468 10/100 ports. Additional port combinations can be created by stacking together the Cisco Catalyst 3750 v2, 3750, and 3750-E Series Switches. The Cisco Catalyst 3750 v2 Series can be purchased with the IP Base or IP Services license preinstalled. The IP Base license offers advanced quality of service (QoS), rate limiting, access control lists (ACLs), and basic static and Routing Information Protocol (RIP) routing functions. The IP Services license provides a richer set of enterprise-class features, including advanced hardware-based IP unicast and IP multicast routing as well as policy-based routing (PBR). The Advanced IP Services license, which includes IPv6 routing and IPv6 ACL support, is now included in the IP Services license. Upgrade licenses are available to upgrade a switch from the IP Base license to the IP Services license. The Cisco Catalyst 3750 v2 Series can be preconfigured with a specific Cisco IOS Software release at the time of ordering. This option eliminates the need to reload a specific Cisco IOS Software release during deployment, thereby reducing deployment time and cost. The Cisco IOS Software release to be preloaded can be selected from a list of supported Cisco IOS Software releases, including the crypto version. The Cisco Catalyst 3750 v2 Series can provide a lower total cost of ownership (TCO) for deployments that incorporate Cisco IP Phones, Cisco Aironet® wireless LAN (WLAN) access points, or any IEEE 802.3af-compliant end device. PoE eliminates the need for wall power outlets for each PoE-enabled device and significantly reduces the cost for additional electrical cabling that would otherwise be necessary in IP phone and WLAN deployments. The Cisco Catalyst 3750 v2 24-port PoE switch can support Class 3 PoE or 15.4 watts (W) of PoE power on all 24 ports. Taking advantage of Cisco Catalyst Intelligent Power Management, the Cisco Catalyst 3750 v2 48-port PoE configurations can deliver the necessary power to support 24 ports at 15.4W, 48 ports at 7.7W, or any combination in between. Maximum power availability for a converged voice and data network is attainable when a Cisco Catalyst 3750 v2 Series Switch is combined with the Cisco RPS 2300 for protection against internal power supply failures and an uninterruptible power supply (UPS) system to safeguard against power outages. The Cisco Catalyst 3750 v2 Series access switches support the new generation of Cisco RPS 2300, which increases availability in a converged data, voice, and video network by providing transparent power backup to two of six attached Cisco Catalyst 3750 v2 Series Switches at the same time. The Cisco Catalyst 3750 v2 Series Switches are capable of reverting to their internal power supply without any service interruption. In addition, the Cisco RPS 2300 can be managed by a Cisco Catalyst 3750 v2 Series Switch that is connected to it. -IPv6 routing included in the IP Services feature set.